R. O. T. Blood Bowl Tournament! Quick and crappy update today because I am super busy at this tournament. Today is the R. O. T. Blood Bowl Tournament in Austin, TX. It is hosted by my friend, Matt. 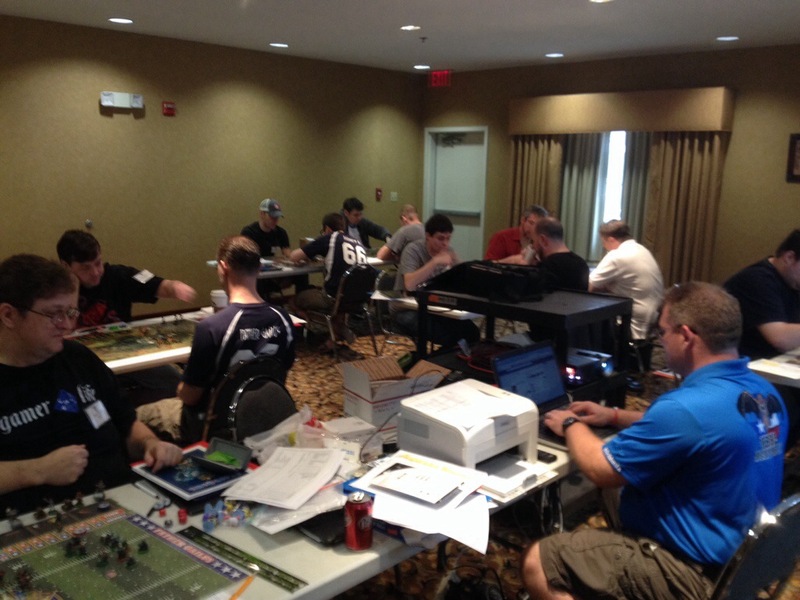 Fun day so far, we have 18 coaches turn out, which is really good for a Blood Bowl tournament these days. It has been about 7 or 8 years since my last tournament, which shows in my playing, as I spent half the tournament on the bottom table. My first couple of games were rough, and I had some REALLY poor luck, combined with good opponents. I decided to bring Orcs since it has been so long, and I have, by far, the most experience with them. Lost the first game, 1-3 against a dwarf team. I know, dwarves are never supposed to score 3 times, but quite a few things just REALLY went my opponents way. My second game was against another Orc team, with a coach who was supremely talented at pushing players off the pitch. That combined with a complete lack of ability to successfully roll anything, except for the most ridiculous touch down I have ever made, allowed my opponent to pull out a last turn 2-1 win. In my final game, I managed to pull out another win, but not really due to any particular skill on my part. It was due far more to the really unlucky rolling of my opponent. He played a Nurgle team… With NO RE-ROLLS… Now, due to the crazy rules of this particular tournament, each coach got one player with Foul Appearance for each game. Combine that with the fact that his roster gave him FIVE PLAYERS with Foul Appearance to begin with, by the time I played him, he had NINE PLAYERS… He also had four players with claw. Against those odds, he should have slaughtered me. Unfortunately for him, his dice completely hated him, and mine finally gave me a great game. He never caused a single casualty, and I managed two, as well as so many KOs that I lost track. It’s still a tough team to play against though, especially with Disturbing Presence. In the end, I managed a 2-1 win. Both of my TDs were in the second half with him receiving both kick offs. All in all, it was a fun day, and a cool way to spend my birthday. I met some cool new coaches, saw a couple I haven’t seen in years, and won a couple of nice freebies.